Want more information about a charity bike build? Get started and learn about important logistics, costs, and tips for a successful and rewarding event. 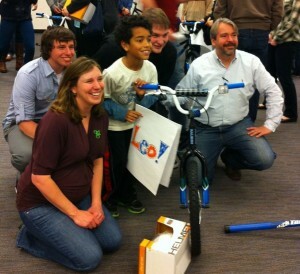 Social Code hosted a remarkable bike build event at the Washington Post in Washington DC. They hosted a Charity Bike Build Team Event. Rebecca Licu organized the event in downtown Washington DC. The Social Code team gathered from New York City, San Francisco, Chicago, Los Angeles, Seattle, and Toronto for a business conference, then they capped off the week by building thirteen bikes for local children. The children were all students from a local charter school of inner Washington DC. The Social Code team built the bikes and made a large card for each child. Bikes for Goodness Sake also provided some team building exercises by Jerry Green. But the highlight was the children. While taking the team photo, the kids sprang into the room to surprise the team. There were many teary eyes of gratitude. It was heart warming. Another special thanks to Revolution Cycle for helping with the event. They have partnered with Bikes for Goodness Sake for several events in the DC area. One of the owners of Revolution is Pinky. He was fantastic helping with the build and working with the recipient children. Pinky has a heart for children. The good people at Social Code and the Washington Post helped to create a memory that will last a lifetime – the memory of a child’s first bike. Well done to the Social Code team. Many happy kids and grateful parents. Nice work. Learn more about a Charity Bike Build Team Event that you can sponsor.